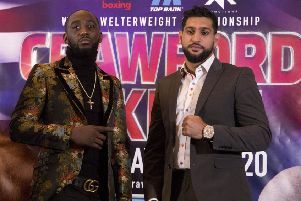 With the pair set to do battle as the headline act on a packed MTK Global show at York Hall – live on BoxNation – Farrag has responded to countless barbs from Edwards suggesting he’s on the downhill. Farrag said: “When it comes to a fight, there is no war of words. The only war I’m interested in happens in a boxing ring on October 26. “Sunny has embarrassed himself on social media in my eyes and shown how immature he is. It’s going to play into my hands on the night. “I’ve been through it all before – talking rubbish to an opponent ahead of a bout. Sunny is still a kid and he hasn’t boxed anyone close to the level I’ve faced. It’ll be tough for him to keep his head and stay focused on the job. “There’s pressure on him in his hometown as the champion. He’s said a lot on social media about what he’s going to do. Sunny has put all sorts of pressure on himself to perform and if he runs and holds all night, he’s going to look bad.